The Erdheim–Chester disease (also known as Erdheim–Chester syndrome or polyostotic sclerosing histiocytosis) is a rare disease characterized by the abnormal multiplication of a specific type of white blood cells called histiocytes, or tissue macrophages (technically, this disease is termed as "non-Langerhans-cell histiocytosis"). Usually, onset is in middle age. The disease involves an infiltration of lipid-laden macrophages, multinucleated giant cells, an inflammatory infiltrate of lymphocytes and histiocytes in the bone marrow, and a generalized sclerosis of the long bones. There have been approximately 500 published papers of ECD in the world since it was first described in the literature in 1930 by the Austrian pathologist, Jakob Erdheim, and the American pathologist, William Chester. Because it is so rare and because it is not discussed in the common textbooks of medicine, many doctors have never heard of it. It is usually difficult to diagnose. For these reasons, some feel the disease could be under-diagnosed and may not be as rare as thought. The first one who coined the eponym “Erheim-Chester Didease” was Jaffe in 1972. Although 500 to 550 cases have been reported until now, the number of cases has dramatically increased in the last 10 years due to increased recognition of the disease. The disease affects both males and females, though with a slight predilection for men (approximately 60% of reported cases affecting men and 40% women), and has a peak incidence between fifth and sixth decade of life, although the manifestation can be at any age. ECD is a progressive disease of unknown origin that has a 5-years survival rate of 41%. The largest investigation of epidemiology of ECD comes from a series of 53 patients evaluated at Pitie-Salpetrière Hospital in Paris, where the mean age of diagnosis was 55 years within a range of 50 to 80 years . Based on this series, ECD appeared to have a male predominance of 73%. A variety of general symptoms may accompany ECD. These are relatively unspecific and do not appear globally in all patients. However, when apparent, they may serve as means for evaluating the patient’s well being and provide gross assessment of the patient’s response to treatment. Amongst them are fever, weakness, weight loss and night sweats. Fatigue may be associated with a microcytic anemia, which occasionally accompanies ECD. Additionally, pediatric cases of ECD may present with a failure to thrive. Involvement of the skeleton occurs in up to 96% of ECD patients. Bone pain, however, occurs in only 50% of the cases. The most frequently affected bones are the femur, tibia and fibula and less frequently the ulna, radius and humerus. Bone pain usually manifests around the knees and ankles. Osteosclerosis occurs bilaterally and symmetrically in the diametaphyseal regions of the long bones. Progression of ECD to the CNS and adjacent structures, such as the meninges, facial bones, orbits and intracranial vasculature can manifest in a wide range of symptoms. The location, size and nature of the lesion determine whether the patient will be completely asymptomatic, suffer from various neurological deficits, severe disability or succumb to his disease. CNS involvement appears in approximately 25% to 51% of ECD patients and accounts for 29% of all deaths. Lesions present with focal symptoms referable to compression of local structures or, when disease is diffuse and bulky, with generalized deterioration of cognition and gait. Intra-axially, ECD manifests more commonly in the dentate nuclei of the cerebellum or in the pons, causing progressive cerebellar symptoms such as ataxia and dysarthria as well as brainstem symptoms. Unilateral or bilateral infiltration of the orbits occurs in ∼25% of patients and can present as exophthalmos, retro-orbital pain, oculomotor palsies, or blindness. Diabetes insipidus is a shared feature of ECD, occurring in ∼25% of ECD patients, although several endocrinopathies have been reported, including hyperprolactinemia, gonadotropin insufficiency, and hypotestosteronism. Approximately 75% of ECD patients suffer from cardiovascular manifestations and about 60% of them will perish due to cardiac complications. The cardiovascular patterns evident in ECD vary depending on the location and size of the lesions. These lesions account for various clinical consequences - congestive heart failure, myocardial infarction, thromboembolism, cardiac remodeling, valvular dysfunction, ischemia, peripheral edema, periaortic fibrosis and others. Pericardial infiltration is the most frequent cardiac manifestation of ECD. ECD associated pulmonary involvement was reported to occur in 43% of the patients. Pulmonary involvement is often asymptomatic but can rarely manifest as dry cough or dyspnea, which progresses over a period of months to years. The majority of cases in which retroperitoneal involvement appears are asymptomatic. When present, the symptoms are dysuria and abdominal pain. The most common cutaneous lesion of ECD is xanthelasma, occurring as yellow eyelid plaques in approximately one-third of patients. Other sites are the face, neck, axilla, trunk, and groin and may appear as yellow or red-brown papules that merge into plaques. The pathogenesis of ECD remains poorly understood, and evidence regarding the clonal basis of ECD has been conflicting. There has been uncertainty about the underlying etiology of ECD for a very long time, and it has been considered to be a non-neoplastic inflammatory disorder as well as a clonal neoplastic disorder. Recent discovery of BRAFV600E mutations yielded the first identification of an oncogenic alteration in this disorder. Estimates of BRAFV600E mutation frequencies in ECD currently range between 38% and 68%, with one recent report suggesting that nearly 100% ECD patients have the mutation if sufficiently sensitive techniques are used. In addition, an oncogenic NRASQ61R mutation was identified in 15% of ECD BRAFV600E wild-type patients and in peripheral blood CD14 cells (but not lymphoid cells), further highlighting the importance of mitogen-activated protein kinase signaling to ECD pathogenesis. BRAF is a human proto-oncogene that makes a protein called B-Raf, which is involved in directing cell growth: B-Raf is a member of the Raf kinase family of growth signal transduction protein kinases. This protein plays a role in regulating the MAP kinase /ERK signaling pathway, which affects cell division, differentiation, and secretion. BRAF V600E mutation leads to increased kinase activity and subsequent increased signaling through the mitogen-activated protein kinase pathway via mitogen-activated protein kinase kinase and extracellular signal-related kinase, which is associated with multiple downstream tumor-promoting effects. This leads to the central role of RAS-RAF-MEK-ERK activation in ECD and the role of activation of RAS- PI3K -AKT signaling: PIK3CA mutations (p.E542K, p.E545K, p.A1046T, and p.H1047R) were detected in patients who also had BRAF mutations. In parallel to these observations supporting the clonal nature of ECD, ECD histiocytes (CD68, CD1a(−), S-100(−/low) non langerhans cell histiocytes) have been found to express a pattern of proinflammatory cytokines and chemokines responsible for local activation and recruitment of histiocytes. Also, other analyses have identified a unique inflammatory cytokine signature characteristic of ECD. This consists of elevated levels of interferon (IFN)-α, interleukin (IL)-12, monocyte chemotactic protein-1, and decreased IL-4 and IL-7. Based on these studies, ECD can now be defined as a clonal disorder marked by frequent hyperactivation of mitogen-activated protein kinase signaling in which an inflammatory milieu is important in the pathogenesis and clinical manifestations of the disease. Recurrent RAS and PIK3CA mutations in Erdheim-Chester disease. A definitive diagnosis is usually based on clinical symptoms, biopsy, BRAF mutational testing and bone scan. •	including polymorphic granulomae, fibrosis, xanthogranulomatosis, proliferating fibroblasts and lymphocytic aggregates. 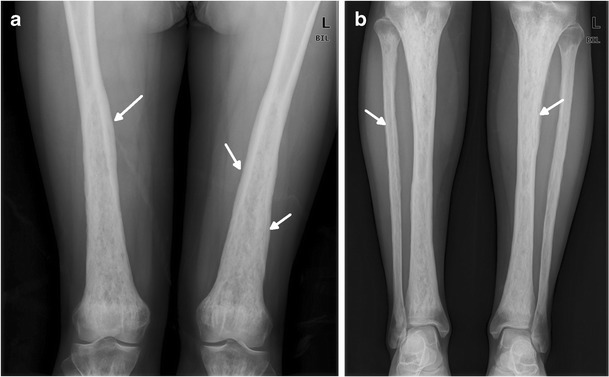 A correct diagnosis relies upon findings of a biopsy of the affected tissue along with imaging studies, such as fludeoxyglucose positron emission tomography/computed tomography (FDG PET/CT) or MR. FDG PET/CT has the advantage of performing an accurate evaluation of the extent of both the skeletal and extraskeletal disease, while MR is useful to evaluate the extent of medullary bone disease and diagnose the presence of associated osteonecrosis. On the other hand, accurate detection of the mutation is also important. The highly variable histiocyte content present in many ECD biopsy samples influences BRAF mutational testing results. Moreover, the frequency of bone biopsies in ECD presents additional challenge to identifying of BRAF mutations. For these reasons, it is strongly encouraged to confirm negative BRAF V600E testing in ECD using >1 genotyping modality and/or genotyping from >1 anatomic site (particularly when bone lesions are found to be BRAF wild-type). Numerous molecular tests to determine BRAF genotype exist. In addition to molecular tests, immunohistochemistry (IHC) analysis of paraffin sections using the BRAFV600E mutant specific antibody (VE1) is possible and has a specificity >95%. Whenever possible, VE1+ IHC staining should be confirmed with molecular testing. Currently, the therapeutic modality with the largest amount of supporting evidence in ECD is IFN-α and pegylated IFN-α (PEG-IFN-α). The optimal duration of the treatment is likewise unclear in ECD, but “long-term” (up to 3 years) treatment with high-dose IFN-α was found to have greater efficacy in high-risk ECD with stabilization or improvement in 64% of CNS disease and 79% of cardiac disease.There is no firmly established dose-equivalence between IFN-α and PEG-IFN-α, but they have several potential toxicities, including constitutional (fever, fatigue, flu-like symptoms, myalgias, and arthralgias), neuropsychiatric, and gastrointestinal symptoms, alopecia and pruritus, transaminitis, and myelosuppression. Side effects were not significantly different between dose levels of IFN-α in the above-mentioned series, although PEG-IFN-α is generally thought to be better tolerated. The consensus recommendation is in favor of PEG-IFN-α, with the dosage determined by the severity and organ dominance of disease. Anticytokine directed therapy (anakinra, infliximab, tocilizumab). Because IFN-α is thought to exert beneficial effects by suppressing the effect of IL-1, treatment with anakinra, a recombinant IL-1R antagonist, has been attempted and found effective. Treatment was well tolerated and particularly efficacious for bone pain and constitutional symptoms. Common side effects include injection site reactions, headache, arthralgias, and nasopharyngitis. Currently, there is less evidence to support anaknira’s use as first-line treatment than IFN-α, but it is reasonable therapy for many patients, especially those without CNS involvement and with prominent osseous or constitutional symptoms. Additional anticytokine directed therapies have been investigated in ECD, including infliximab and tocilizumab, an anti-tumor necrosis factor-α antibody. Although further study of this therapy is necessary, it may be considered as second-line treatment. Corticosteroids, cytotoxic chemotherapies, radiotherapy, and surgery. Prior to the discovery of IFN-α as ECD treatment, many therapeutic regimens involving cytotoxic chemotherapies were used, including vinca alkaloids, anthracyclines, cyclophosphamide, and high-dose chemotherapy with autologous stem cell transplantation. Corticosteroids may reduce edema acutely, for example in severe exophthalmos, but are not considered effective monotherapy. The purine analog cladribine has been used in the treatment of both newly diagnosed and refractory ECD. Use in the second-line setting should be considered. Radiotherapy to ECD is used only as short-term palliation with disease progression within months. The role of surgical debulking is limited in ECD to severe orbital lesions or surgically resectable intracranial lesions. 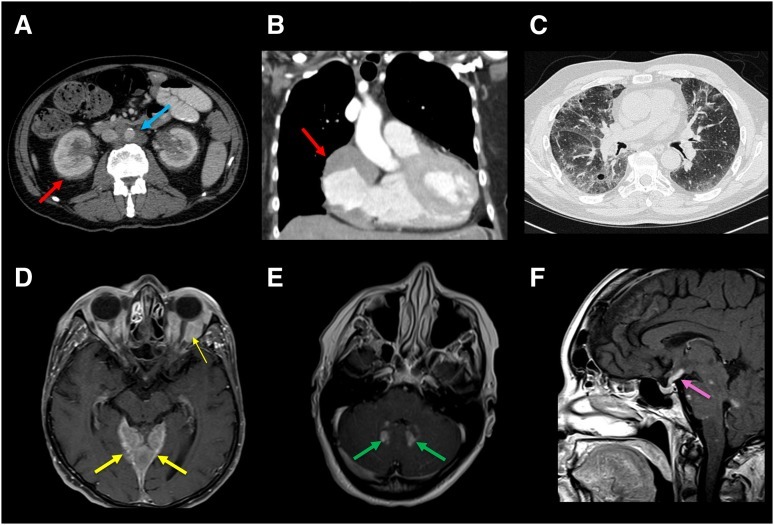 Treatment with vemurafenib, an inhibitor of BRAF harboring the V600E mutation, showed dramatic and unprecedented clinical and radiographic improvement. Clinical experience with vemurafenib in ECD is rapidly increasing. Common toxicities include fatigue, arthralgias, headache, and multiple skin complications, including the development of squamous cell carcinomas. Because vemurafenib is not currently FDA approved for histiocytic disorders, enrollment in clinical trials rather than off-label use is encouraged.